China's stock market is in complete disarray. For the second time in four days, trading was suspended under new circuit breaker rules unveiled this week. Many observers believe the circuit breakers, which are aimed at easing volatility, are actually creating more chaos by causing investors to sell out of fear they won't be able to get their money out before trading is stopped. The good news is that China held an emergency meeting on Thursday and decided to suspend the circuit breakers effective Friday. Peter Boockvar, chief market analyst at The Lindsey Group, said the move could take some short-term pressure on Chinese stocks but won't be a cure-all. 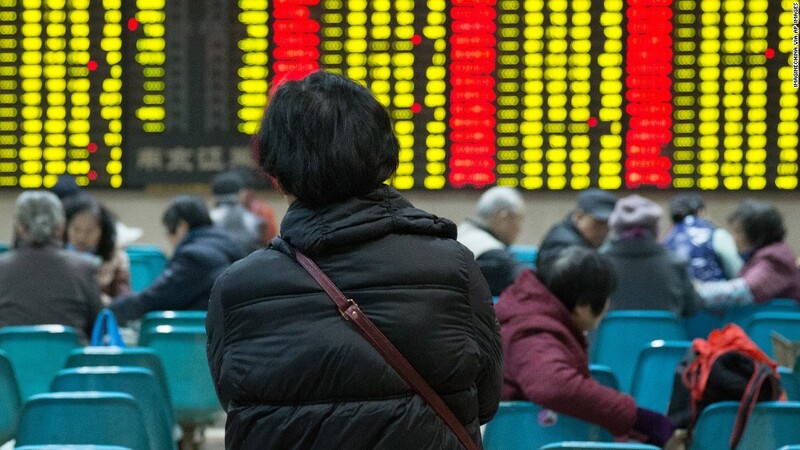 "People now don't have that same deadline to sell...but China's stock market is going to go where it's going to go," said Boockvar. Investors are also alarmed by the decline in China's currency. The country's central bank set the yuan's value at the weakest level since March 2011. The currency devaluation may help boost growth, but it can hurt asset values and cause money to exit the country. To that point, China's central bank said it burned through a record $108 billion in foreign-exchange reserves in December in an effort to slow the sharp devaluation of its currency. While investors should focus on China's economy, not its turbulent equity market, the economy isn't looking great either. New reports released this week reinforce concerns that China is slowing down more than investors realized. As if China's crash wasn't enough, crude oil continues to nosedive. Crude plunged as much as 4% to $32.10 a barrel, the lowest level since late 2003. That's a great thing for consumers because it's going to send gasoline prices even lower. But it worries investors because cheap oil crushes profits for energy companies. Even though oil's plunge has been mostly driven by oversupply, cheap oil also raises concerns it's signaling something alarming about poor demand due to slower global growth. Against this backdrop, stocks in Europe fell more than 2%, while Hong Kong equities plunged 3%. In a sign of the concern among investors, gold jumped another 1.5% to $1,108 an ounce. Gold, already up 4% this year, tends to rally when fear is on the rise. CNNMoney's Fear & Greed Index, which is calculated based on several market indicators, is also flashing "fear." Just a week ago it was in "neutral" territory. All of this has raised fears among some like billionaire George Soros that this could be a repeat of the 2008 financial crisis. Others think stocks will rebound from the China fears, which is exactly what happened last summer. "I think this too shall pass. One of these days we'll get a panic that's really justified by the fundamentals of a global recession. I don't think that's the case on this one," said Yardeni.